I am in a mood to prepare parathas nowadays. 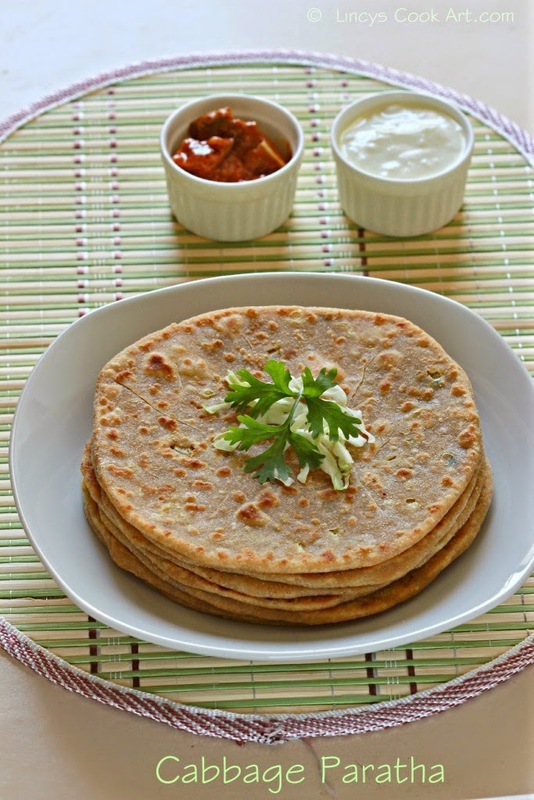 I love stuffed parathas as they are a comfortable dish for my family. I can send it with my husbands lunch box or even i can use it for my dinner. If i prepare less spicy i can feed my son also. So filling and also a dry dish which people liked to carry for offices and picnics and travel. I love them as they are so versatile and perfect for my present hurry burry life. I can prepare the stuffing at night and in the morning i can able to make hot parathas out of it. About the recipe you can add chopped cabbge and masalas directly into the atta and make this paratha. But you wont get a soft paratha as you cant able to massage the dough. So i prefer to prepare cabbage parathas following this method. This way i can add double the quantity of stuffing inside a paratha and can make more tasty and soft parathas. To make cabbage stuffing, heat oil in a pan and fry jeera. Add the chopped onion and cook for fifteen seconds. Add the ginger garlic paste and cook till the raw smell leaves. Add the chopped cabbage and salt. Cook for thirty seconds on low flame with out adding a any water. Add the masala powders turmeric powder, red chilli powder and garam masala and mix well and cook till the raw masala smell leaves. Keep the cabbage stuffing inside and gather the edges and press well to seal well. Serve with pickle or yogurt. cabbage paratha looks very delicious.. Perfect click. Healthy and low-calorie parathas. Looks delicious! inviting stacks of parantha they are.. Beautifully rolled parathas, lovely stuffing and delicious they are.